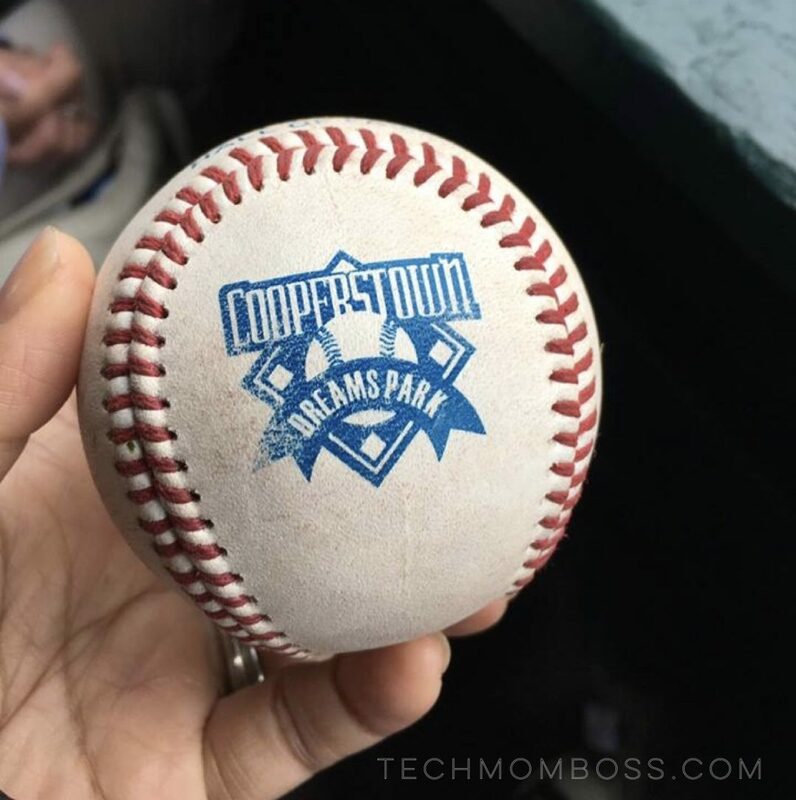 Here are some tips to help you get ready for a trip to Cooperstown Dreams Park. If you’ve never been there I can tell you it is like the Disneyland for baseball! Planning for it can be daunting so knowing what to expect helps. I’ll share a little bit about our experience and some things I wish we knew before we went. As far as our experience goes, I can tell you it was amazing and to this day my son still talks about it as one of the best times of his life. My son went with his baseball team the summer after he turned 12. He got to play the National Anthem on guitar for opening ceremonies and he also hit his first home run at the park! He made memories that will last a lifetime. The tournament itself is about a week. During that week the boys sleep in the barracks, have meals in the “mess hall”, trade pins, and talk/play/practice baseball. It was basically wake up, baseball, repeat and they loved it haha. They get a little free time depending on game schedules. We spent a little of that time exploring the area and visiting the Baseball Hall of Fame. Labels — You want to label your clothes and things! During the week all the uniforms and socks go into the wash together and the team and coaches are living together in one big room so it’s easy for everyone’s things to get all mixed up. To keep a little bit of sanity, it’s a good idea to label your things. These IdentaMe personalized labels are great because you can stick them right on your clothes (no ironing needed) and they stay on even through the wash! Before we packed I put labels on all my son’s things — on the clothing tag on shirts, the waist-band for pants and underwear, and on the tops of the foot for socks. One extra tip regarding socks — put the label somewhere at the top or bottom of the foot. Don’t put the labels anywhere you can see them outside their shoe. The park officials don’t want to see any kind of logos on the socks. Lastly, the labels are meant for clothes but I used them on chargers and other things and they worked fine for non-clothing items too. If you want to get the same ones, use my coupon code for $5 off! Pin bag — During the week at Cooperstown if you’re not playing baseball you’re trading pins. 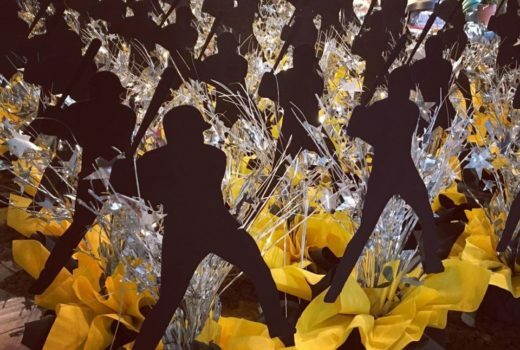 It’s a fun way for the kids to meet and interact with everyone there, and you get to collect some cool pins. We used a pin bag to hold all the pins and it worked perfectly. There is a store called Wilson Trophy that sells them and you can order online on Wilson’s website. You can keep your own pins in one of the zippered compartments and then there are “pages” where you can pin the ones you collect. Microfiber Towels — For the barracks use these microfiber towels (they dry faster than regular towels!) and I suggest getting 2. Device Charging — I would coordinate with the other moms and have someone bring an extension cord and power strip for the barracks since there’s only a few outlets. Or, this portable charger worked out perfectly for us. On one charge my son charged his phone and powered his USB clip-on fan every night at Cooperstown. Shower accessories — For the barrack showers we used this shower lanyard for soap and shampoo and this caddy to carry everything else. Stuff to get there — You will need a pillow and sleeping bag for the barracks. There is a Walmart in Oneonta (about 20 min from Cooperstown if I remember right) where you can stop and get a pillow, sleeping bag, case of water, or basically any other big bulky stuff you might need. Buying these bulky things locally will save you from trying to pack them in your suitcase. What I did was order that stuff online at walmart.com and checked the box to pick it up at the Oneonta Walmart store. The Oneona Walmart address is 5054 State Highway 23, NY 13820. An extra tip is to just make sure you research and look online far enough ahead of time. The idea is to see what the availability is so you can figure out when you should place your order for pickup. So basically just go on the Walmart website ahead of time and fill your online cart like you’re going to order but don’t buy it just yet. You just want to see when it will be available. Pictures — When you’re at Cooperstown they have a photographer taking pictures of the players at each of the games. I suggest going on the website after every game to look for photos of your child and favorite the ones you like/want. The park has a photo center with several computers set up where you can view and choose pictures you want to print. The lines there sometimes get pretty long, especially when it’s almost time to leave. If you flag all your favorites it will make it so much easier and faster when you go to print out your photos. Packing Tips — Some days it rained and other days it was warm and sunny. Mornings and evenings were chilly. My suggestion is to bring clothes for all seasons i.e., a pair of shorts, jeans, sweats to wear at night, light jacket, rain poncho, etc. Also, in the barracks the boys have to shower together in a big shower room. You should pack swim shorts and flip flops that they can wear in the shower. See packing list below at the bottom of this post or download a copy here. Baseball Hall of Fame — You will have a little bit of down time during rain delays or between scheduled games. You definitely need to visit the Baseball Hall of Fame which is a museum with lots of wonderful and interesting baseball displays and memorabilia. One of my favorites was the League of Women display which included Rockford Peaches memorabilia. The website says the average visitor spends 3.5 hours at the Hall of Fame, but you could definitely stay longer. At the minimum I suggest setting aside at least 2 hours (but that’s really not enough time!). You might even want to come a couple times if you don’t get to see everything the first time you go. If you think you want to come more than once you might consider getting a membership. When we went admission was Adults (13-64): $23, Seniors (65+): $15, Children (7-12): $12, Veterans: $12, Active/Retired Military: Free, Children aged 6 and under: Free. A membership costs $25/child and $50/adult which gets you complimentary admission for a year, a lapel pin, and 10% discount and free shipping on any purchases in the Museum Shop. We ended up getting a membership. Travel Tips — Since we had never been to the East Coast, we planned some extra stops before and after our Cooperstown visit. We spent 3 days in the Manhattan/Times Square area to see the sights and catch a Broadway play, went on to Cooperstown for our baseball tournament, then stopped in Boston for 2 days to do more eating and touring and caught a game at Fenway Park before we finally headed back home. While we were in Manhattan, we did Scott’s Pizza Tour and highly recommend it! On the walking tour you get to stop at several pizzerias of historical and cultural significance, which included Lombardi’s the first pizza place in America. We got to tour the kitchens, investigate the ovens, and try a slice or two of pizza at each place. Everyone gets a Pocket Pizza Journal to take notes with (check the back of the journal for a pizza dough recipe!). When it was time to leave Manhattan, we took the Amtrak train to Albany, NY. One tip for taking the train is when you first get to the station look for the guys in the red caps. They will help you board on the right train and get all your luggage on before the mad rush of other passengers. Give them a good tip. It is so worth it and will help ease your stress. Here was our itinerary with highlights of our trip and a helpful packing list! 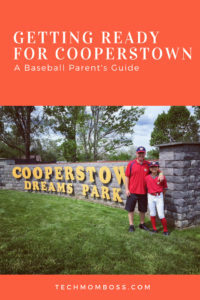 Hope my tips help you out as you plan for your Cooperstown trip!